Woke at 5:30 am in a burn near a dry spring. Left before the others, except Bugs who left about five minutes before me. Hiked down and down the 7.5 miles to Walker pass, ran out of water on the way down. 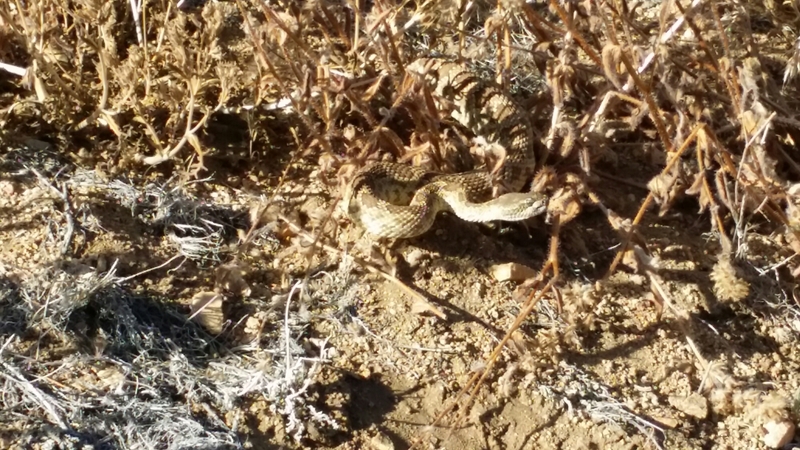 Ran into this guy today, rattling away. Mostly they just like to warn you and are perfectly harmless unless you decide to mess with them. Which is why something like 90% of rattlesnake bites are on 20 something males who are intoxicated. Got to the bottom and Waffles and Brian (now known as Gingersnap) hitched to town to get food and beers and candy for everyone. It being a 37 mile hitch it took a long time so I did laundry and got everything charged up. The duo came back with beers and burgers and candy and we had a killer little meal sitting at the campground. We decided to do some miles so we did five mostly uphill miles and found a great spot as the sun set. I will take pictures in the morning, one of our better camping spots so far. Sadly, we need to do heavy miles the next two days to get to Kennedy Meadows when we wanted. The schedule is getting barfed up.